The Eastern Conference’s biggest rivalry over the past two seasons kickoffs again on Tuesday night as the Heat head to Indiana to take on the Pacers. It will be the first time these two teams have met since the Pacer’s Game 7 playoff last season. Indiana boasts the NBA’s best record at 18-3 and should be motivated after losing their third game this past Sunday at Oklahoma City. The 118-94 loss was by far the largest amount of points given up by the Pacers. The Thunder’s 61 percent shooting percentage was also the best an opponent has shot against Indiana this season. The Pacers finished their five-game road trip with a 3-2 record and will look forward to facing the Heat on their home floor, a place they have been excellent this season. Still undefeated at 9-0, and surrendering just 81.8 points per game, Indiana’s home court dominance is the best in the league. Miami is surely up to the challenge. The reigning NBA champions lead the Eastern Conference with over 103 points per game, and LeBron James continues his unbelievable play. The three-time MVP is shooting a career best 49.4 from the field and 47 percent from three-point range. The Heat improved to 16-5 on the year after a 110-95 win over Detroit on Sunday and did it without Dwyane Wade. 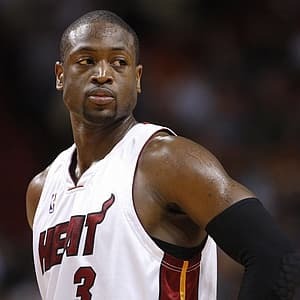 Wade looks to return to action tonight and should be a tremendous boost for Miami on both ends of the floor. This is certainly a game most NBA fans will be tuning into tonight, and it should be one heck of a game. While the Heat are still the defending champs, I can’t help but notice how they have trouble against larger front lines. They did take care of the Pistons, but the Pacers inside are a different story, and an area where Miami has struggled all-year. Let’s not forget the revenge factor is in play here, as well. This game means a lot more to the Pacers than the Heat and LeBron has already stated that he is not interested in regular season rivalries. Indiana has bounced back well from losses and are excellent at home. The crowd will be behind in this game, and I think take their first matchup against Miami this season. The NYK head to Quicken Loans Arena today to take on the Cavaliers on Tuesday night in a matchup of two struggling Eastern Conference franchises. Amar’e Stoudemire scored a season-high 17 points off the pine, but the Knicks continued to have trouble in the paint without center Tyson Chandler. They were outscored 42-22 in the paint and were outrebounded 46-26. Cleveland has not fared much better this year but has been far better at home than on the road. They are 6-3 at home this year but just 1-10 on the road. Still, at 7-13 it has been a rough start for the Cavaliers who had high expectations coming into this season. Their last game was a low-scoring grind it out win against the Clippers in L.A. Kyrie Irving was held scoreless in the 88-82 win, and Tristan Thompson led all scorers with 20 points while adding 13 rebounds. Andrew Bynum has been a force over the Cavs’ past four games, averaging 18 points and 9 rebounds per contest. All signs point to Cleveland in this spot. Not only are they at home, a place they play much better at, but the matchup is excellent. The Knicks frontcourt and rebounding prowess have taken a massive hit since losing Chandler, and they are seemingly continually dominated in the paint. Bynum’s recent improved play gives him an enticing matchup tonight. Not only that, the Knicks have looked out of sync offensively all-season long. This team has rarely put together even a weeklong stretch of solid basketball. Even when they do rattle off a few wins, they get put back into place with a devastating loss. Cleveland should dominate at home tonight. Detroit will go for their fifth win in six games on Tuesday night as they host the Minnesota Timberwolves. The Pistons have played much better as of late, and much of that is due to center Andre Drummond. His play has pushed Detroit to a 4-1 record this month, including a 107-97 win at Miami on Tuesday. However, the Heat bounced back against the Pistons on the latter leg of a home-at-home and handed Detroit a 110-95 loss on Sunday, which snapped their four-game win streak. Drummond had 19 points, 14 rebounds in the game and also added two blocks and steals. After a strong start to the season, the Timberwolves had had a rough stretch on the road this year. They have lost their last six of seven away from home and are one of the poorest teams shooting teams in the league at 42.3 percent from the field. They were thoroughly dominated by the Miami Heat on Saturday, losing 103-72 and shooting a terrible 29.3 percent. Minnesota will get Kevin Love back tonight after he missed Saturday’s game to be with his family after the death of his grandmother. Love is having another All-Star season despite the Timberwolves struggles. He is leading the Wolves in scoring with 23.7 and leads the league in rebounding at 13.6 per game. Detroit’s offense is mostly an interior, in-the-paint unit which capitalizes off second chance points and their size upfront. This will not work against a Wolves team with both Love and Pekovic. They are one of the NBA’s best rebounding combos and will give the Pistons all they can handle. Minnesota has an edge in their backcourt as well and should be able to steal one from Detroit at home.